First cut the eggplant into half. Do not cut the edge. 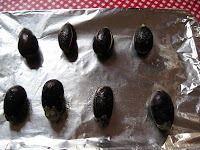 Place the eggplants in a baking sheet and spray cooking spray and sprinkle a little bit of salt on top of it. In the mean time, preheat oven to 400 degrees. Bake the eggplants for 10 mts or until its 3/4 cooked. The skin will become tender when the eggplant is 3/4 cooked. Take it out and let it cool. In the mean time, roast the coriander seeds, channa dhall, red chillies, white sesame seeds, peanuts and coconuts to golden brown and grind it into a fine powder. Add the turmeric powder to this grounded mixture and mix it well. When the eggplants are done and are ready to stuff, start adding the grounded powder inside the eggplant. Try to stuff it with your hands and keep it aside. 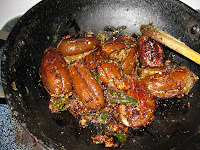 Take a pan, pre heat oil, splutter mustard seeds, add the eggplants one by one and cook it in low flame. Cover it with a lid for the first 3 mts and let it cook in the oil. Flip it over and let it cook on the other side too. Leave it in the stove, keeping the flame very low and let it become crispy. If you think, the quantity of oil, is a lot, you can reduce the oil quantity and use PAM in the place of oil. I was on liquid diet for the past one week. I bought a big chunck of watermelon the week before last, and my husband didn't even bother to give that to my girls when I was lying down last week (which I expected pretty much from him:D). 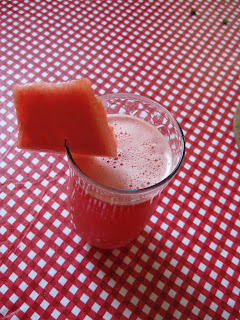 Luckily, it didn't spoil and I made this juice day before yesterday, in large quantity, so that I could drink it very often. I tried giving juice to my girls but they are not a big fan of juices. So now a days i am filling up popsicle cups with these fruit juice which i make at home and giving it as popsicle sticks which they love to eat. Infact, i made complan yesterday and filled it in the popsicle cups and gave my girls as complan popsicle which they really liked. They will not drink anything except milk(which i am forcing them now a days). 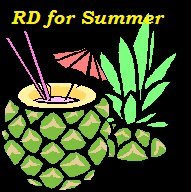 Well coming back to this recipe. Just put everything in the blender and blend it. Filter it if you want to and Enjoy! Pre heat oil in a pan, add bittergourd, tomato and onion and saute for five mts. till it becomes 3/4th cooked. In the mean time, dry roast fenugreek seeds, coriander seeds, red chillies and coconut and grind it into a fine paste. Keep it aside. Once the veggies are 3/4th cooked, add the tamarind paste to required amount of water, add the grounded paste to tamarind water, add turmeric powder, sambar powder and salt and pour it on top of the veggies and let it boil for another 5 mts. When everything mixes well, add the jaggery and add water according to the required consistency. Garnish it with curry leaves and enjoy. In this post, i will be talking about the comfort food No.2 (according to me ofcourse!). Paruppu Usli - More kozhambu. 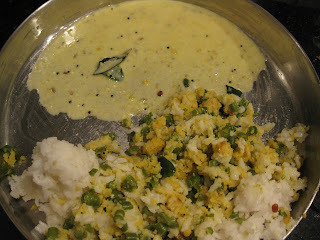 In my mom's place, they make more kozhambu as a main dish which goes along with rice just like sambar. 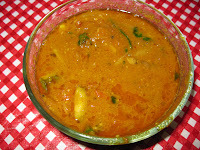 They make potato or chepangezhangu or Yam fry as a side dish along with papadam, for more kozhambu. They make paruppu usli once in a while as a side dish for sambar rice. I still remember my mom used to make paruppu usli for drumstick sambar. But in my in-laws place, they have this combination of making paruppu usli and more kozhambu on the same day and they mix rice with paruppu usli, more kozhambu as side dish. After marriage, I was there with my in-laws for 10 months. When my MIL made this dish one day, I started blinking as usual and asked her why she made paruppu usli for more kozhambu. I found a logic behind her reply. As you all know, lentils are the main source of protein for vegetarians and we have to take it everyday in some form or the other. 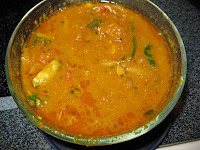 We use toor dhall for making sambar. But while making more kozhambu, we will not use lentils. 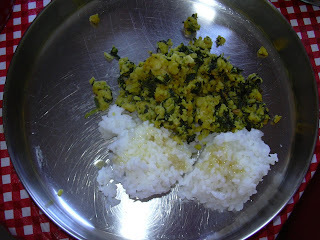 In order to compensate that, she made paruppu usli, which is full of lentils. I never thought this way before. So after that, I always make paruppu Usli, whenever I make more kozhambu which happens to be one of my favorite meal (once a week).